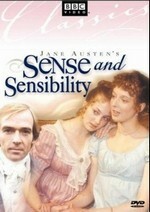 This is my second review for the Sense and Sensibility Bicentenary Challenge 2011. *throws confetti* It is my year-long homage to Jane Austen’s first published novel, Sense and Sensibility. This 1981 BBC seven-part miniseries of Sense and Sensibility is a solid but flawed adaptation of Jane Austen’s masterpiece. In my mind, the character of Marianne Dashwood is always the benchmark for a superior adaptation. She is a complicated creature driven by emotion and racked with vulnerability, and if the actress portraying Jane Austen’s most melodramatic character can play her as intended, the whole production can rest on her shoulders. Tracey Childs as Marianne Dashwood exuded all the frantic emotion and romantic “sensibilities” that Marianne should at all the right moments, and Irene Richards as her sister Elinor was equally convincing, and at times touching, as her stoic, stable and guarded counterpart. However, my disappointment in the male characters: Edward Ferrars, John Willoughby and Colonel Brandon, pushed this production below my expectations. Part of this can be attributed to the loose adaptation of dialogue by screenwriter Alexander Baron and partly to Austen herself, who chose to craft male roles that are weaker than the two female ones. Yes. Not everything in Sense and Sensibility is balanced, and that was Austen’s point. Even though this imperfection is one of its charms, it can be unsatisfying. Here is the description of the production by the distributor. Offering equal measures of humor and drama, this magnificent remastered BBC production is an utterly charming version of Jane Austen’s Sense and Sensibility. This delightful story tells of two sisters attempting to find happiness in the tightly structured society of 18th century England. Elinor, disciplined, restrained and very conscious of the manners of the day, represents sense. Outspoken, impetuous, emotional Marianne represents sensibility. Attracted to a man already promised to another, Elinor suffers silently to keep scandal away from her family. Marianne enjoys a flirtation with a handsome scoundrel that could lead to her downfall. Through their experiences with men and their relationship with each other, they learn that neither sense nor sensibility alone is enough, but that one must strive for a balance of the two. The “magnificent remastered” boast makes one wonder what they had to start with? Considering that this was originally videotaped instead of today’s standard of digital film, we must allowances, but it is still blurry and faded in comparison. The film locations are mediocre too. I have been truly spoiled by the 1995 Ang Lee and the 2008 John Alexander productions magnificent locations. The costumes exhibited the oddest colors and most unflattering of Regency styles in *gasp* polyester fabrics, and the screenwriter Alexander Baron chose to eliminate little sister Margaret entirely! (For shame) What saves this 3 hour adaptation is the acting. Irene Richards, who you might recognize from her portrayal as Charlotte Lucas in the 1980 BBC Pride and Prejudice, is a solid oak who bends with the wind of change and shades her sister and mother from her own romantic pain. Her scene where Colonel Brandon asks her to inform Edward Ferrars of this offer of a church living was really moving. Tracey Child as Marianne happily did not play the melodrama over the top like Ciaran Madden did in the earlier 1971 production. I was amazed at the similarity of her interpretation to that of Kate Winslet’s 1995 version. Minor roles of note were Julia Chambers who plays cunning vixen Lucy Steele to a tea, and Amanda Boxer as stingy Fanny Dashwood. The scene where Fanny discovers that Lucy Steele and her brother Edward have been secretly engaged might be one of the best screaming scenes on film! Overall, an enjoyable but flawed production that could have benefited from more of Jane Austen’s beautiful language. Win one copy of the BBC Sense and Sensibility 1981 by leaving a comment by midnight PT March 2, 2011 stating what intrigues you about this adaptation of Sense and Sensibility or who your favorite character was. Winners will be announced on Thursday, March 3, 2011. Shipment to US addresses only. I saw this production when it first came to the US in the 1980s. I have always been fascinated by the character of Elinor Dashwood because she has to bear so much from other people’s folly. In fact, I named my daughter Elinor in honor of Miss Dashwood. When watching this production, I always feel as if Edward is played by an actor who is way too old – he seems older than Col. Brandon, who is played so amiably that I do wish he and Elinor would get together! The best enjoyment of this version of S&S is the elder Miss Steele who just captures the idiocy of that character to a T.
The clothes are dreary, as are the lighting and sets, but the good actors make up for much of those deficiencies. The trembling chin of Irene Richard always gets me! OOh! I’d love to see this version!! I can’t remember seeing this one, so I’d like to give it a go. I agree with you. I too have been spoiled by the Emma Thompson script. Yes, the acting was excellent, but without Thompson’s humor, it was a snooze. I don’t think I could get through it again knowing that I have Thompson’s on my shelf. I already have this adaptation. I’ve just seen this and wrote about it in my blog. Like you, I found it quite melodramatic in places, and didn’t enjoy the costumes and male actors in the series. Overall, I found the acting a little staid, and at times, ludicrous (like the scene where Fanny Dashwood gets hysterical). But it’s not a terrible first version – like you said, we have been spoiled by the beautiful locations and styles of Ang Lee’s S and S.
I’ve never seen this particular adaptation, but reading through your comments, and watching the slide show, I’m struck by the realization that back in 1981, I would not have been interested in this show. Now in my retirement years, I’ve developed an interest in the regency era, the costumes, settings, mores, etc. Shows like Downton Abbey, the Cranfords, Lark Rise to Candleford – my absolute favorites. I would love to have this video. thanks for the giveaway. Despite its flaws, I really love this version. I remember watching it for the first time and, during the scene where Elinor tells Edward about Colonel Brandon giving him the living, just getting butterflies in my stomach from watching the emotions of the characters- all that restrained passion! Just lovely. you have me totally intrigued ~ thank you! Bosco Hogan, who portrayed Edward, was 32 years old, when this episode aired. I never liked the idea of Elinor and Colonel Brandon as a couple. They are too similar in temperament. Which makes an unbalanced couple, in my opinion. This is why I don’t care for Elinor and Edward as a couple. Again, they are too similar in temperament. It’s a pity that Austen did not create a more extroverted love interest for Elinor. i am particularly intrigued with this version being a 7 part series, wonderng how this version would handle that extended length ~ and having spent time in uk, the locations used in this adaptation is of particular interest. having not yet viewed it, i am open to discovery ~ especially reading the preceding comments and your own review ~ it’s left me in anticipation! and would luv to win the offer! thank you for your generosity! Its time lenght is not that extended, true, it has 7 episodes but of less than 30 minutes each, so this production last less than 3 hours in total. thx for taking time to let me know Cinthia! I liked this adaptation. When Fanny began to cry I was scared! I can hear the screams of that creature, until today! I do like this adaptation. Obviously it just cannot compare with the later 1995 or 2008 versions, but I feel that is mostly due to budget and technology. It was made for TV, didn’t have funding of a major film, and also feels a little shabby due to its costumes and being filmed in video instead of being digital. However, I feel that Marianne is very well portrayed indeed, almost as good as Kate Winslet’s portrayal! And as you have said, it is unfortunately the men in this production that let it down. Nobody can compare to the likes of Hugh Grant and Alan Rickman, or Dan Stevens and David Morrissey! Despite it all, and the lack of Margaret, it is quite a faithful adaptation and is one I have watched more than once, and intend to watch again. As a British literature teacher and a Jane Austen fanatic, I would love to own a copy of this version. I saw it years ago but, like you, I’ve been so spoiled by Emma Thompson’s brilliant adaptation it has been quite a while since I’ve cared to see any other version! She really set the gold standard, Just as Andrew Davies did for Pride and Prejudice. Still, I would love to add this S&S to my extensive Austen collection. I have two bookcases dedicated to her works, books about her and her world, and DVDs of her life and various adaptations of her work! I have a space all ready for this! It has been a long time since I watched this version but it has my favourite version of Elinor. I didnt really notice the absence of Margaret either. I too thought this versions Edward seemed a little too old. Considering I loved how Alexander Baron adapted Jane Eyre for the 1983 version (the one with Timothy Dalton as Rochester), I was not as impressed with his adaptation of this S&S. Although it is still worth watching just to see how far S&S adaptations have come.